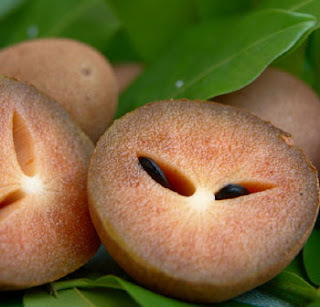 Sapodilla (Manilkara achras [Mill. (Fosberg)]) is a long-lived, evergreen tree native to southern Mexico, Central America and the West Indies. It is grown in huge quantities in India, Mexico and was introduced to the Philippines during Spanish colonisation. The fruit is a large ellipsoid berry, 4-8 cm in diameter, very much resembling a smooth-skinned potato and containing 2-5 seeds. Inside, its flesh ranges from a pale yellow to an earthy brown color with a grainy texture akin to that of a well-ripened pear. The seeds are black and resemble beans, with a hook at one end that can catch in the throat if swallowed. The fruit has a high latex content and does not ripen until picked. The flavor is exceptionally sweet and very tasty, with what can be described as a malty flavor. Many believe the flavor bears a striking resemblance to caramel. The unripe fruit is hard to the touch and contains high amounts of saponin, which has astringent properties similar to tannin, drying out the mouth. The trees can only survive in warm, typically tropical environments, dying easily if the temperature drops below freezing. From germination, the sapodilla tree will usually take anywhere from 5-8 years to bear fruit. The sapodilla trees yield fruit twice a year, though flowering may continue year round. In Vietnam, the most famous varieties of sapodilla is grown in Xuân Đỉnh village, Hanoi. 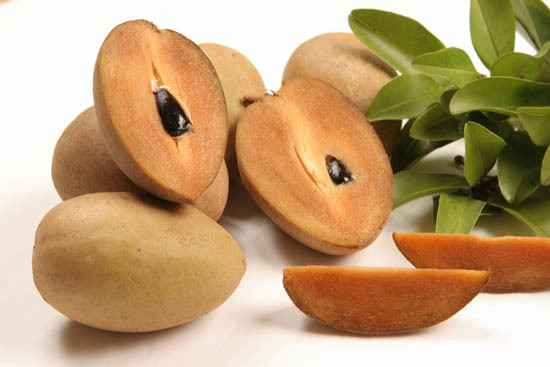 Sapodilla is known as chikoo ("चिक्कू" or "chiku," "चीकू,") and sapota in India, sobeda/sofeda in eastern India and Bangladesh, Sabudheli ("ސަބުދެލި") in Maldives, sawo in Indonesia, hồng xiêm (lit. "Siamese persimmon"), lồng mứt or xa pô chê in Vietnam, lamoot (ละมุด) in Thailand, Laos and Cambodia, sapodilla in Guyana and Trinidad & Tobago, naseberry in Jamaica, sapathilla or rata-mi in Sri Lanka, níspero in Colombia, Nicaragua, El Salvador, Dominican Republic and Venezuela, nípero in Cuba, Puerto Rico and Dominican Republic, dilly in The Bahamas, naseberry in the rest of the Caribbean, sapoti in Brazil, chico in the Philippines and chico sapote in Mexico, Hawaii, southern California and southern Florida. In Kelantanese Malay, the fruit is called "sawo nilo" which is closer to the original name than the standard Malay "ciku". In Chinese, the name is mistakenly translated by many people roughly as "ginseng fruit" (人參果), though this is also the name used for the pepino, an unrelated fruit; it should instead be "heart fruit" (人心果) because it is shaped like the heart.